Best Seller Publishing announces the release of Camilo Graza’s new book, “Passport to Heavenly Eternal Life.” It will be available for free download in the Amazon Kindle Store on March 25th. This book reveals the purpose of God in creating this vast universe including humankind. He created us as His masterpiece for His glory. But we transgressed and become unfit to serve Him. Although our sins are red as crimson, it still can become white as snow. God expects a complete surrender of our lives to Him, by refraining from our misdeeds and follow the footsteps of His son Jesus Christ, who shed His blood and died for us in the cross. God did not just create us for nothing but had adopted us His children, as the Bible says: “The Spirit himself testifies with our spirit that we are God’s children. Now if we are children, then we are heirs-heirs of God and co-heirs with Christ, if indeed we share His sufferings in order that we may also share His glory.” Romans 8:16-17. The Bible further says: “He who overcomes will inherit all this, and I will be his God and he will be my son.” Revelation 21:7; and He said, “I tell you the truth, unless you change and become like little children, you will never enter the kingdom of heaven. Therefore, whoever humbles himself like this child is the greatest in the kingdom of heaven. And whoever welcomes a little child like this in my name welcomes me.” Matthew 18:3-5. 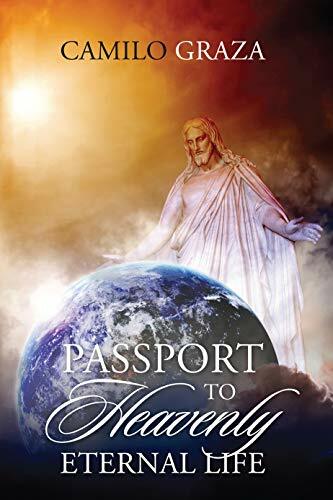 “Passport to Heavenly Eternal Life” by Camilo Graza will be free and available for download on Amazon for 5 days (03/25/2019 – 03/29/2019) at: https://www.amazon.com/dp/B07PLMJKBP. “‘Passport to Heavenly Eternal Life’ by Camilo Graza is a very fascinating book. This book talks about the heaven, earth and universe and provides a way to freedom of salvation. His insights are backed by specific references to scriptures and provide clear answers to questions that many of us have. The book is easy and ready to understand and proceeds in a logical manner to provide insight on how we can have eternal life with God. The book gives comfort to those who are in need of God’s presence by giving clear descriptions of how the doors to the Kingdom of Heaven are always open and how we can enter by accepting Jesus Christ as our Savior. The book describes the presence of the Holy Spirit and aids in understanding our relationship with God and Jesus Christ. I recommend this book for everyone. The text is easy to read, gives sound advice on understanding our relationship with Jesus Christ, and is based on specific quotations from scriptures of the bible.” – Alexander P.
“‘Passport to Heavenly Eternal Life’ is an impressive book. The chapter about ‘our real home’ was particularly moving and really drew me in. It included an especially relevant quote: ‘We are from matter turned into clay and transformed into life by God when he breathed into our nostrils and gave us a soul and life.’ Thank you Mr. Graza for the intriguing photos - some were very unexpected but appreciated and fitting to the content. I enjoyed the relevance of the Bible verses accompanying the text and various points made by the author.” – Will R.
Camilo C. Graza is a Church Lay Preacher, Educator in Estate Planning, Retirement & Pensions. Mechanical Engineer in Aerospace, Petrochemical and Manufacturing Industries, and a member in the Insurance Million Dollar Round Table Organization.